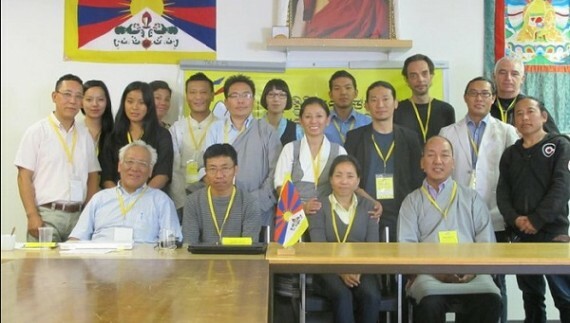 The Tibetan Youth Congress concluded its two-day preliminary meeting of the European leg of Rangzen conference in Zurich yesterday. An exclusive group of 18 delegates representing four countries in Europe included Switzerland, France, Belgium, Germany and UK attended this meeting. Prominent former political prisoners such as Phuntsok Nyidron, Sonam Dorji and Jamyang Tsultrim attended this conference. The two-day meeting had only two agendas for discussion. Ways of reasserting the essential aims and goals of restoring independence of Tibet and development of confidence and pride of Rangzen advocates. Some of the highlights of this meeting were to rebrand Rangzen by creating a specific Rangzen symbol that can be used by every Rangzen advocates, including organisations. There were some critical comments made about restoring Rangzen dignity and integrity. It was expressed that any individual, or organisation who has Rangzen as a goal should be more vocal about their opinions as Tibetans in Tibet especially political prisoners have no wish to live under Chinese administration. Additionally, the main aim and the call of protests inside Tibet has always been clearly about Rangzen. The meeting also addressed the consistent question of strategies for the road ahead for restoring Rangzen and the related need to address the status of Rangzen advocates in the Tibetan community. People who make unfounded criticisms and are generally antagonistic towards Rangzen advocates should be confronted instantly by providing the clarity and insight and the value of propagating Rangzen, the meeting underlined. Participants firmly attested that many people have lost their lives protecting our historical legacy of Rangzen and in order to maintain the future prospect of the next generation, we cannot and must not submit ourselves to live under the Chinese national flag. Therefore Tibetans should stand united to fight for our basic right for Rangzen and not lose hope nor the will and determination for Rangzen. The time has come to prepare for the future course of actions. It might take years but as Rangzen advocates our pledge should be to pass on this legacy to our next generation. A clear guideline of various policies, internal and foreign, of independent Tibet will be presented. Through this clarity we could possibly make a better argument about why it is crucial for that particular country to support our Rangzen endeavours. It was also stressed that we should evaluate the response of the exile Tibetans to the 2008 uprisings in Tibet and introspectively look at the mistakes and the achievement so that we are better prepared in the future. At the time of arrest and interrogations of political prisoners one is often asked if he/she is a member or if they have any connections with Tibetan Youth Congress. The Chinese government hostility towards TYC stems from the fact that TYC stands for Rangzen. Therefore, TYC will be firm, vigilant and clear about its position and the general public on their part should reciprocate to this conviction by supporting the aims and principles of TYC. We will be clear about two things in this endeavour; our faith in His Holiness the Dalai Lama and our respect for the Tibetan government in exile which will not diminish restore our belief in the struggle for Rangzen. Few participants who could not attend the meeting sent written proposals and ideas. The preliminary session, on the 23/24 July, in Europe was held in Zurich in association with the Tibetan Youth Association Europe (TYAE). The Conference is in line with resolutions reached during its 14th General Body Meeting, where TYC decided to call an International Rangzen Conference. In view of the wide disperse of potential participants, TYC Centrex members resolved to organize preliminary conferences in four different regions: Europe, North America, East Asia and India. The TYC delegates consisting of the President, Vice President, General Secretary and the Financial Secretary visited Takna Jigme Sangpo at his residence while they were in Switzerland as he was unable to attend the conference.